Renault has revived the Alpine subbrand 22 years after it was discontinued due to poor sales. GENEVA -- Renault is hoping to shed its mass-market image by taking on Porsche with a new low-slung, high-end sports car from its revived Alpine subbrand. 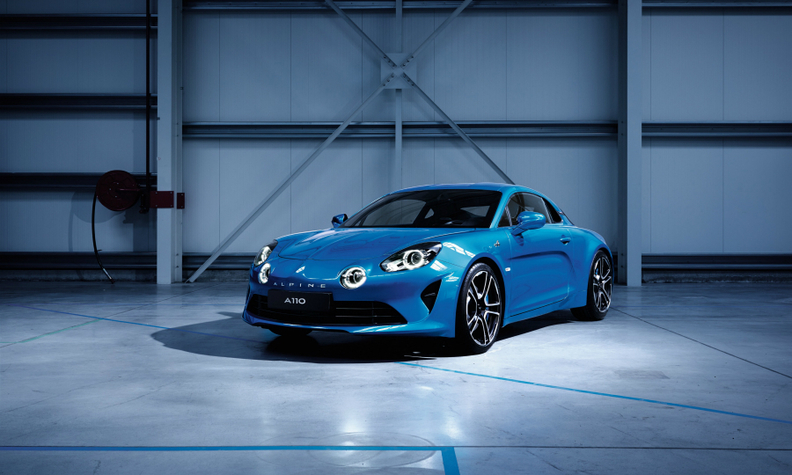 The limited-edition Alpine 110 two-seater with a four-cylinder turbo engine -- a revival of a once-popular model shuttered over 20 years ago -- was unveiled at the Geneva auto show on Wednesday. Priced at 58,500 euros ($62,000), it'll be the automaker’s most expensive passenger auto and can reach 100 kilometers (62 miles) per hour in 4.5 seconds -- about as quickly as a Porsche 911 Carrera. Renault is seeking to add panache to its range by selling more expensive models. While Renault been gaining market share with a fresher, more upscale lineup including the new Megane hatchback, its effort to lure wealthier buyers comes at a risky time as the region's demand for autos cools after three years of growth. "The sports car market is a little bit in decline and Porsche is a key competitor in that space," said Ian Fletcher, an analyst at forecaster IHS Automotive. The French manufacturer isn't alone in reaching higher. PSA launched its premium car brand DS two years ago, and Porsche parent Volkswagen Group this week unveiled a new upscale Arteon fastback from its namesake VW brand to compete with Mercedes coupes at a lower price. Carmakers are pushing more expensive models to raise the funding needed to pay for costly investments in electric and self-driving technologies. Renault's quest for cash is also tied to its unique ownership structure. CEO Carlos Ghosn is under pressure to balance out Renault's partnership with its more profitable Japanese partner Nissan Motor Co., where he serves as chairman. While Nissan contributes most of the income to the alliance, it has less sway because it only has a 15 percent stake in Renault and no voting rights, while the French carmaker holds 44 percent of its Japanese counterpart. Narrowing the margin gap between the two companies would help reduce friction that's built up in recent years. Borrowing from electric-car producer Tesla's marketing strategy, Renault has been offering the new Alpine for sale online since the end of last year. The first run of 1,955 cars --- a reference to the date when the marque was created -- was sold off in 72 hours. While that makes up a sliver of the 3.18 million vehicles Renault delivered last year, it'll test market appetite for a wider range of Alpine-branded vehicles. In its heyday, the Alpine nameplate was known best for the A110 Berlinette coupe, which beat Porsche cars in rally competitions in the 1970s. About 30,000 Alpines were built before the line was discontinued in 1995 to poor sales. The carmaker has been working on the revival for more than five years, initially under the direction of its then-Chief Operating Officer Carlos Tavares, who now runs PSA.